I received the Lunar Nomad Oracle from Weiser Books, like magic, there it was, falling though my mail slot one morning. This is a luscious, shadowy, intuition-inspiring deck, and I am already a little bit in love with it. When I first took it out of the packaging, which is a sturdy and attractive box that holds both the deck and the guidebook, I wasn’t sure what to make of it, beyond the fact that I immediately loved the dreamy imagery and style. It is called the Lunar “Oracle”, and yet it has the structure of a Lenormand deck, and yet again seven new cards have been added to the mix. So what exactly is it, and what is its purpose? 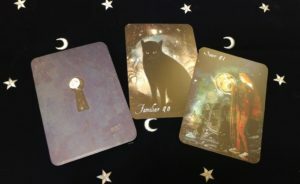 Creator Shaheen Miro explains that the Lunar Nomad Oracle is, “a set of keys for unlocking and understanding your Lunar self”. The deck speaks directly to your intuitive self, awakening your sense of wonder, creativity and perception as you move through the world. As I looked through the deck for the first time, having to go slowly due to the large size of the cards, I felt myself being pulled down into the images, as if there are many layers waiting to be traveled through. The beautifully written guide book, with the foreword by Theresa Reed, contains an explanation of the Lunar Self, plus meanings for each card and exercises or prompts to go deeper. 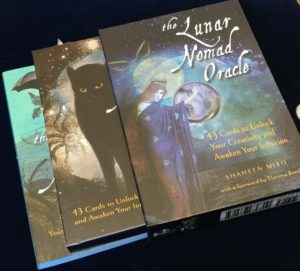 Shaheen includes methods and spreads for reading the cards, with examples, followed by the most intriguing section, “How to Become a Lunar Nomad”. I am fiercely (and stubbornly) dedicated to the Tarot, but I am excited to see where the Lunar Nomad Oracle will take me. I have to admit, Shaheen captured my heart with two of the cards he added to the traditional Lenormand, the Familiar and the Seer. How am I supposed to resist those? This deck is gorgeous, it invites you to gently shake your intuition awake, and then to go deeper, and deeper. To me, it feels like diving into a dark ocean, as well as expanding out into the cosmos.Off I go, to start my path as a Lunar Nomad, with my familiar at my side.